Three fresh original Christmas tunes, ranging from sweet to swinging, sung by jazz vocalist Rebecca Kilgore with performances by stellar jazz artists. 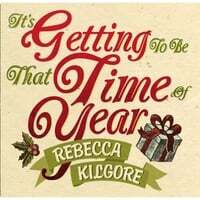 IT'S GETTING TO BE THAT TIME OF YEAR is the first offering from the Moonshadow Project, the unique collaboration of Rebecca Kilgore, Ellen Vanderslice and Mike Horsfall, who have teamed up to produce 18 original songs, with each partner contributing melodies, harmonies and lyrics. A full-length CD, MOONSHADOW DANCE, is expected to be released in 2015.